Making sure the therapeutic oils we recommend are 100% from the indicated botanical source on the label is our top priority. Unfortunately, this is not true for 95% of the oils on the market today. Most oils are manufactured (synthetic) to be used for taste or fragrance, not for therapeutic purposes, and are called “nature-identical,” even though they are not identical to what nature makes. Our unadultered botanical oils are 100% pure – no fillers or alcohols added. And, the oils have never been rectified, peroxidized, decolorized, denatured, reconstituted or mixed with ANYTHING. All oils are certified organic, whenever possible, and can be used for sinuses, energy, immunity, and mental clarity, as well as many other wonderful therapeutic uses. These oils can be researched at Young Living or Click here to search for certified organic essential oils and other aromatherapy products. 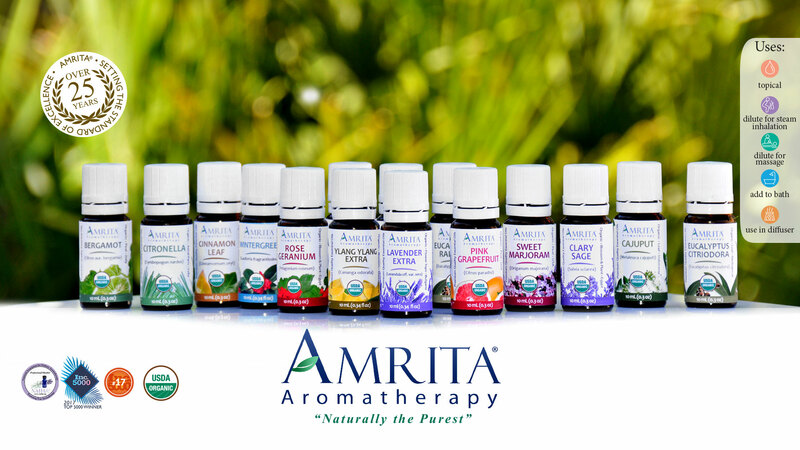 Amrita Oils are the oils we retail at Atlas Chiropractic & Nutrition for you to stop by and to pick up or you can order your oils along with other supplements through Emerson/Wellevate on the how to order page. It's also possible to order directly through Amrita Aromatherapy and have them shipped directly to you. Both companies ship free with a $49 order. To order Young Living Oils, customers can call 1-800-371-3515 and use physician access code #615568. Click to view the properties of a few popular essential oils in the Essential Oils Uses Chart. BASIL: All varieties of basil are helpful for producing mental clarity, focus and alertness. The potent therapeutic plant is antiseptic, pain-relieving, fever-reducing and spasm-suppressing, all of which make Basil Essential Oil ideal for helping with cold and respiratory problems. Basil can also be used to calm frazzled nerves and uplift the emotions. The sweet, warm scent of Holy Basil offers stress and anxiety reducing effects in addition to all the other benefits of the basil species. Holy Basil is also said to increase faith and compassion, qualities that are important to the millions of spiritual seekers who consider it a treasured substance. BIRCH: The scent of Sweet Birch Essential Oil is familiar and sweet, like wintergreen candy or root beer. Sweet Birch can be inhaled to calm nerves and promote sleep. It is applied topically to relieve pain in muscles and joints. It can also reduce cellulite, water retention and inflammation. BERGAMOT: Bergamot is a unique, rare fruit with a treasure trove of positive qualities. Bergamot is loved the most for its euphoric scent. It is equally treasured for its mental benefits as well as its physical benefits. It reduces anxiety and depression, calming the mind and reducing worries. Stimulates digestion and relieves skin conditions such as herpes, shingles, dermatitis, eczema and boils. Useful with infections of the urinary tract and bladder and for tonsillitis, mouth infections, sore throat or halitosis (bad breath). CAJUPUT: Similar to Eucalyptus in smell. Cajuput is a wonderful antiseptic for colds and removing mucous, and it is also excellent as a muscle rub, insect repellent, and migraine reliever. Its great advantage over Eucalyptus is that it’s milder and more suitable for children. Respiratory system: Bronchitis, catarrh, congestion, coughs, sinusitis, asthma, sore throat. Skin problems: Acne, oily skin and hair, preventing insect bites. Genito-urinary system: Urinary tract infections, cystitis, leucorrhoea. CEDAR: Sweetly fragrant Himalayan Cedar wood chips are collected and steam distilled to collect the essential oil. When you open the small bottle, immediately your senses will be soothed by the wise and gentle essence of these ancient trees, creating the perfect mood for meditation. It has a regulating effect on the nervous system and is calming and sedating. The antiseptic, balancing qualities present in the wood help clear up skin conditions, while its anti-inflammatory effects soothe arthritis and rheumatism. Cedar Essential Oil may also assist the lymphatic system. Nervous System: Anger, anxiety, frustration, irritability, migraine, panic, PMS, restlessness and stress. Skin Care: Bruises, psoriasis, eczema, rashes, boils, chicken pox, dermatitis, acne, allergic reactions, burns, cuts, wounds, insect bites, toothache, teething pain, sensitive skin. Musculoskeletal System: Gout, back pain, muscle soreness, arthritis, rheumatism, muscle spasms and cramps, neuralgia, inflammation, sciatica, bursitis, sprains. Respiratory System: Hay Fever, Allergies. CITRONELLA: Citronella gets its uplifting joyous scent from being a cheery lemon-scented oil which gives Geranium Rose its mood lifting aroma. Citronella has an uncanny ability to revive exhausted bodies and relieve sore muscles at the same time. It not only repels annoying insects but Citronella actually kills head lice when applied to the scalp. It is also recommended for fighting the cold virus through inhalation. Nervous System: Fatigue, Nervous Exhaustion, Migraine, Headaches, Neuralgia. Respiratory System: Cold, Flu, Minor Respiratory Infections. Skin Problems: Excessive Perspiration, Oily Skin, Head Lice, Insect Repellant. Musculoskeletal System: Arthritis, Rheumatism, Muscle Pain. CINNAMON: Cinnamon Leaf Essential Oil is sweet, spicy and warm like Cinnamon Bark, but with a slightly more clove-like scent. The aroma brings to mind cozy winter days snuggled around the fireplace with a tasty mug of spiced hot cider. “This essential oil is like a warm wrap that softens nasty side effects of a cold – shivering and painful joints. Added to a liniment or bath oil, cinnamon could help warm older people who tend to chill easily during cold winter months or others who are physically weak or recuperating from illness. Similar effects may be noted for psychological symptoms, like emotional coldness, isolation, tension, and fear. The essential oil arouses physical senses and creativity. Nervous System: Nervous Tension, Stress-Related Disorders, Weakness, Fatigue, Low Self-Esteem. Skin: Lice, Scabies, Dental Care, Warts, Wasp Stings. Musculoskeletal System: Poor Circulation, Rheumatism. Immune System: Chills, Colds, Flu, Laryngitis, Infectious Diseases. CLARY SAGE: Clary Sage Essential Oil has a refreshing, sweet-smelling aroma that immediately produces comfort and mood enhancement. Due to this effect, it is used to treat depression and hysteria.In addition, Clary Sage has many properties that make it nourishing and balancing to the female reproductive system. It relieves cramps and the pain of childbirth. Because it balances estrogen production, Clary Sage increases breast milk production and regulates hormone levels during menopause. The comfort women feel in their bodies when using Clary Sage is a natural result of their hormones being smoothed out. In addition to being great for women, Clary Sage has powerful chemical properties that promote relaxation and pain relief. CLOVE BUD: This is a sweet, spicy scent. Used for tooth pain, freshening the breath, unblocking breathing passages and even repelling insects, it also stimulates mental alertness. CYPRESS: Cypress is calming and dependable oil. It soothes respiratory issues, relaxes an overburden mind, reduces excess fluids, tones the veins and balances oily skin. ELEMI: Elemi is sometimes used to accompany a meditation practice because it encourages calmness, peace, compassion and strength. Used for aged skin, wrinkles, acne, eczema, inflammations, and infected cuts and wounds, anxiety, stress, nervous exhaustion, congestion, bronchitis, cough, muscle and nerve pain. FIR: Fir essential oil is steam distilled from the needles and twigs of the Canadian and northeast American balsam fir tree. It has been used for centuries by Native Americans for medicine and in religious ceremonies. It is used for chest colds, bronchitis and asthma and other conditions of the upper and lower respiratory tract. It may also help with arthritis, rheumatism and other forms of joint pain. Balsam Fir is used in anti-anxiety blends due to its elevating, strengthening quality. Its wonderful scent purifies the air and is often included in blends to diffuse over the holidays. FRANKINCENSE: Warm, woody, sweet, spicy, calming and consciousness-expanding, frankincense has been used in religious ceremonies for centuries, as it promotes meditation and prayer. Frankincense is used to treat anxiety, stress and tension and is helpful for calming the mind, aiding the attainment of a meditative state. It slows the breath rate, which is one of the signs of deep relaxation. Its astringent properties make Frankincense helpful in clearing the respiratory channels affected by cold or flu. It also has tissue regeneration capabilities, so it is both helpful in decreasing fine lines and wrinkles on facial skin as well as healing scars and wounds. Frankincense also has pain-relieving properties. GERANIUM: Rose Geranium Oil has been valued for its delightful perfume-like aroma and yet it is so much more than a beautiful scent. It has a balancing effect on the female physiology, which relieves premenstrual and menopausal symptoms by regulating hormones. Emotionally, this essential oil lends confidence, happiness and relief from stress, so it is a handy aroma to carry with you on a job interview, a first date, or any occasion that produces anxiety. It is an excellent beauty aid for clearing up acne by bringing balance to sebum levels in the skin and stimulating cell regeneration. It is also extremely detoxifying which makes Rose Geranium Oil helpful in removing bacterial and fungal infections. It also helps in healing wounds and soothing skin inflammations such as eczema. Because it is a diuretic, Rose Geranium Oil reduces cellulite and water retention while aiding lymphatic drainage. GINGER: Simulates circulation, warms cold feet and hands and decreases cardiac fatigue. Stimulates digestion while decreasing flatulence. Excellent for coughs, colds, bronchitis, sinusitis and sore throats. Soothing for rheumatism, arthritis and sore muscles. Boosts confidence, determination, personal drive and optimism. GRAPEFRUIT: This fresh, sweet citrus oil is cold-pressed from the peel of the grapefruit. When diffused it has a cool, dry scent that is uplifting and reviving. It stimulates digestion and curbs the appetite. Organic grapefruit essential oil is used by some for getting rid of self criticism, reducing cellulite, water retention, or obesity and for oily skin. HELICHRYSUM: Helichrysum is said to heal bruises quickly as well as fade old scars, prevent new scars, heal acne, eczema, stretch marks and more. To regenerate scars, it is used in omega 3 rich carrier oil. As it has expectorant and anti-inflammatory properties, it is also excellent for respiratory issues, such as colds, flu, allergies and bronchitis. In addition, the serotinum variety is highly suited for emotional healing. The comforting scent helps the person get in touch with unresolved feelings and emotions that may have been denied for a long time. It can help access forgotten memories and is therefore a valuable tool for processing emotional injuries. LAVENDER: The refreshing, floral scent of Lavender creates a calm, peaceful atmosphere, while instilling a sense of well-being. It harmonizes your nervous system with the perfect balance of masculine and feminine qualities. Lavender is healing, rejuvenating and cleansing for your skin. It is well-known for its ability to heal burns, as well as cuts, bruises, insect bites, sore muscles and scars. With its mothering energy and soothing aroma, it is the first choice in the treatment of insomnia and all stress-related conditions. LAVADIN: Sweet Lavandin essential oil is steam distilled from the flowering tops of a hybrid of Lavender and Spike Lavender. Lavandin can be grown more easily than true lavender and thus is less expensive. It is used in perfumes, cosmetics, soaps and lotions. It is said to be antiseptic, antifungal and antibacterial. It has a calming effect. LEMON: Lemon essential oil is full of energy, sparkle and optimism. One of the more popular essential oils, it is a superb immune booster, cold and flu fighter, disinfectant for the home and spirit lifter. LEMONGRASS: This strongly scented tall grass is lemony and herbaceous. It is native to Asia but now is cultivated in the East and West Indies and Central America. In traditional Indian medicine, it was used for fever and infectious illnesses. LIME: Lime essential oil may be used as a disinfectant and detoxifying agent. It is used to treat sore throats and the flu. Its astringent, toning and refreshing properties help clear oily, congested skin. When diffused, it may help with mental fatigue, MANDARIN: Mandarin is a sweet, happy oil. Similar to Tangerine Essential oil, it uplifts our spirits, soothes the mind for a peaceful sleep, calms our digestion and helps us deal with stress. MARJORAM: Marjoram Essential Oil is the ultimate, warm, comforting, and calming oil. It helps melt stress, worries and insomnia away, soothes muscle pain, relaxes headaches and lessens colds and digestive complaints. NUTMEG: Nutmeg has been used in herbal medicine for gastrointestinal ailments such as diarrhea, gastric spasms and flatulence. It is an excellent oil to add to a massage oil because of its warming property for muscular aches and pains, as well as for rheumatism. It is also classified as a tonic and an aid for general fatigue. OREGENO: Organic oregano essential oil is steam distilled from the dried flowers of a plant growing in the Mediterranean area. It is used to treat conditions of the upper and lower respiratory tract, as well as influenza. It is a very strong oil and can irritate the skin, but when diluted it can be used as a natural treatment to heal skin conditions such as psoriasis and massage painful joints. It was also used in French hospitals to clear the air and by native Americans for purification and healing. PALMAROSA: Palmarosa has a sweet, floral, rosy odor. Even before the essential oil was first distilled, the crushed plant was used in antiquity to relieve joint pain and other pain. Palmarosa oil has been reported to have excellent antiseptic, antifungal and antibacterial properties and is used extensively in skin care. It is widely used in perfumes and as a fragrance in soaps. PATCHOULI: The oil of patchouli is widely used in Asia for incense, body and garment perfumes and insect repellents. Arabs used it to perfume carpets; Indians perfumed textiles, and the Chinese produced a perfumed ink for use on scrolls. In Europe, oil of patchouli is widely used in perfumery, cosmetics and soaps. PEPPERMINT: The fresh, slightly spicy, mint aroma of Peppermint saturates a room with freshness, clarity and vitality. Refreshing and stimulating, Peppermint Essential Oil has remarkably immediate effects on mental functioning. It seems to produce clear thinking and the ability to focus. It also is an excellent pain reliever and is always useful to have around. The oil belongs in every first-aid kit since it helps remedy acute dizzy spells, rapid heartbeat, tremors, shock and general weakness. A few drops inhaled from a tissue can bring quick relief. Mint oil is ideal for treating headaches, reactions to severe weather conditions, and tightness in the neck area. ROSEMARY: Rosemary is known for its ability to wake up the body and spirit. Rosemary is known to help the circulatory system and increase muscular blood flow. It can be used as a heart tonic and is perfect for pre-workout massages. Rosemary is commonly used in hair care products, as it is reputed to renew hair growth and prevent premature baldness. It is used in the treatment of dandruff and oily hair and scalp. It is also known to have a positive effect on the cephalic regions, clearing the mind as well as improving memory and overall brain function. Rosemary contains camphor, which can help improve circulation and respiratory function. Therapeutically, Rosemary Oil can be used to promote blood flow to the pelvic region and uterus and support the digestive system. It is a diuretic and expectorant decongestant. Rosemary is also a known pain reliever. SAGE: Sage Oil has a fresh, herbal scent with many therapeutic properties. It is known to reduce swelling, redness and inflammation. It can help promote blood flow to the uterus, reduce excess water retention and bring down fever. There are claims that Sage Oil can also stimulate hair growth, ease muscle and joint pain and raise blood pressure. It is a wonderful antiseptic and disinfectant. SANDALWOOD: Emotionally, Sandalwood is grounding and instills a sense of inner peace; therefore, it may be helpful in cases of stress, depression and low self-esteem. Sandalwood can also treat colds, dry coughs and intestinal spasms. It is known as a tonic for the immune system, a moisturizing treatment for mature skin and an aid to meditation, creativity and spiritual growth. It is also an aphrodisiac. SPEARMINT: The U.S. is the major producer of Spearmint essential oil, which is steam distilled from the fresh flowering tops. Spearmint has traditionally been used as an aromatic, stimulant, antiseptic and local anesthetic. It has an uplifting effect on the nervous system and is used to treat acne and congested skin. Its most common use at this time is as a flavoring in toothpastes, chewing gum, candy and mouthwashes. SPRUCE: The freeing scent of this oil elevates and refreshes. It is known to uplift the emotions and relieve muscle aches and joint pain. Its biggest benefit may be its help in dissolving blocked energy in the chest area, which is associated with depression and chronic fatigue. It also helps with poor circulation and respiratory weakness. Spruce’s woodsy, fragrant aroma can help open and release emotional blocks, bringing about an experience of balance, strength and peaceful security. Since the effects of using Black Spruce Oil are both calming and elevating, it is an excellent choice for yoga and meditative use. Spruce also has long been enjoyed in the sauna. TANGERINE: Tangerine Essential Oil is ready to bring sunshine and peace to even the most trying day. Its aroma is sweet and citrusy with a bottom note that leaves you in a refreshing pool of sweetness. Tangerine Oil is an excellent, delicious-smelling non-toxic choice to soothe digestion, purify the body and home and relax anxious thought patterns. It is also a great oil for children, due to its soft, sweet and calming scent. As purifying oil, Tangerine helps to detoxify the body by cleansing waste products and toxins from the body and supports the natural cleansing functions of the kidneys and liver. Due to this detoxification effect, it also increases tissue blood flow and lymph drainage and may also help as a general blood purifier. TEA TREE: It is known as one of the most powerful immune system stimulants in the world of herbology and has won a reputation as a “cure all” because of its use in treating fungal, viral and bacterial infections. Its germicidal action is not as strong as that of more aggressive oils like oregano; however, its great advantage is that it is mild and not a skin irritant, so it can be applied for long periods of time. Tea Tree is also known for its remarkable skin-healing properties and is often suggested to help treat everything from acne, bug bites and sunburn to athlete's foot and dandruff. Its antiseptic and analgesic properties make it perfect for cleaning wounds and treating all manner of infections, while offering soothing pain relief. THYME: Thyme has a fresh medicinal scent and a is a powerful immune stimulant. It is often used to treat respiratory, digestive and circulatory concerns, to relieve muscles and joint pain and as antibacterial and anti-fungal oil. It has been be used effectively to treat gastritis, upset stomach, fatigue, chills, Candida and intestinal parasites. VETIVER: Vetiver is a spiritual oil. It has a grounding influence, fortifying one’s connection with the earth element. When diffused Vetiver may help clarify thinking, soothe irritability and dispel the effects of exhaustion. Vetiver can be used to reduce thirst, heatstroke, fevers, headaches and premenstrual syndrome (PMS). It is said to boost the immune system. It may also be used for rheumatoid arthritis, as well as acne and other skin disorders. In perfumes, Vetiver makes a beautiful base blend of oils. WINTERGREEN: Wintergreen essential oil is steam-distilled from the organic leaves of the plant. It has an intense sweet-aromatic odor and is used as a flavoring in toothpastes, and chewing gum. Wintergreen oil is also used extensively in liniments because of its anti-inflammatory and ant rheumatic properties. YLANG YLANG: This uplifting and soothing oil can help treat depression, rapid breathing and heartbeat, high blood pressure and premenstrual syndrome (PMS). It is also a powerful aphrodisiac.